Amy, and her husband, Doug, are restoring their own fabulous old house, and Amy sent me an email today. She had scored big time on Craigslist. Incredible. I need two such marble vanities for the Cross House. Even more incredibly, Amy intended to keep the vanity, rather then donate it to the Cross House! 10 Responses to Amy is MEAN! Of course, we all say things in anger and frustration that we don’t really mean….. but I may have to sit downstairs and just stare at the sink to take my mind off of things. And I won’t tell you what I paid for it. Because I still need you to like me, a little. Hum, a road trip to Pittsburgh…? 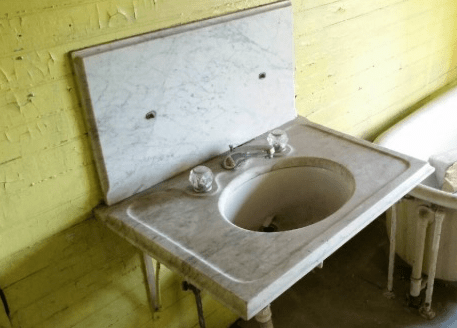 There’s a similar sink in my parent’s attic ( I can’t believe they removed it and replaced it with a home depot pedestal sink in their 1904 house). It’s badly cracked though; I think a corner is missing. Can someone enlighten me as to the purpose of the two holes drilled into the marble backsplash? They’re out there Ross! Just keep looking! I picked one up at auction tonight for literally just a $20 bill, backsplash included. You’ll get lucky one of these days! Just a thought, because I am so, so, so in love with your project and the way you share its story with us. I could ho on about the particulars that make your story so compelling, but suffice it to say that I have, like so many of your readers, been inflamed by an intense desire to help in some way. I’d love to just give you money, if only I could… or a bucket truck! Sending a big, arms-wide hug to the house! I love these, and have been looking for my house. Here are three that might be of interest! The bathroom begins…yay! So exciting for you. I’m delighted that you do careful demo so that functional items can be re-used. The HGTV gut-it/smash-it practice is such a waste. I think you meant your comment for Amy’s blog!